The Reserve Bank has taken the highly unusual step of switching its preferred home value data, arguing that CoreLogic's figures overstated price growth in April and May due to a methodology change. A notable feature of RBA governor Glenn Stevens' statement explaining the rate cut was an observation that "dwelling prices have been rising only moderately over the course of this year". That statement appeared to be at odds with CoreLogic data on home prices, released just the day before, that showed 6.1 per cent growth in home prices nationally, year-on-year, with much stronger results in Melbourne and Sydney. The discrepancy was explained in the RBA's quarterly Statement on Monetary Policy, released today, which relied on data from APM (part of Fairfax's Domain property group) and the Real Estate Institute of Australia. In the statement, the RBA explained that it has disregarded CoreLogic's data because it appeared to significantly overstate price growth in April and May. "While one source of data recorded strong growth in housing prices in April and May, that growth appears to have been overstated and other sources suggest that housing price growth was modest over those and more recent months," the bank noted. It appears that a methodology change by CoreLogic, implemented during April, may have contributed to higher index values in those two months than were warranted by actual transactions. The research firm changed the way it filters out unusually expensive and cheap property sales within each area from using a static dollar figure, which was excluding more and more high-end sales as the general price level rose, to using a percentage filter. CoreLogic's head of research Tim Lawless acknowledged that the changes to the index may have temporarily bumped up the figures for a couple of months. However, he said other data indicate that those two months were still relatively strong for Sydney and Melbourne housing sales. "Those two months did coincide with a surge in valuations activity - so there was more mortgage level activity across the marketplace - and, of course, we also saw a surge in auction clearance rates during April and May as well," Mr Lawless told ABC News Online. Mr Lawless said the Reserve Bank is correct to conclude that growth in housing prices has slowed, with both Sydney and Melbourne recording annual price increases around half those seen at the peak of the market last year. However, he would not use the adjective "moderate" to describe home price growth in Australia's two biggest cities. The latest CoreLogic figures for July, which are generally accepted not to be affected by the earlier methodological change, show month-on-month price growth of 0.8 per cent nationally, 1.3 per cent in Sydney and 1.1 per cent in Melbourne. 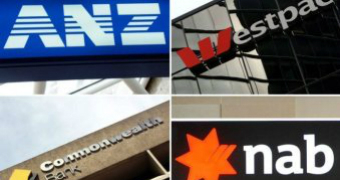 By keeping part of the RBA's rate cut from home buyers, and lifting deposit rates, the big four banks boost financial stability. Mr Lawless described it as "still a very strong month-on-month result". On an annualised basis, last month's result would put Sydney price growth back above 15 per cent and Melbourne above 12 per cent. Even the national average price rise would be nudging double-digits. "If we look at household income growth, for example, it's currently tracking - depending which state you're in - between 3 and 4.5 per cent, wages growth of course is at a record low, tracking at around 2 per cent growth," Mr Lawless observed. "You'd expect housing market conditions, at least over a longer term, to be tracking broadly in line with household income growth. "So we're still seeing Sydney and Melbourne tracking well above the level of income growth, which of course is unsustainable." With the Reserve Bank having cut interest rates to a fresh record low of 1.5 per cent, all eyes will now turn to whether the apparent slowdown in Sydney and Melbourne property price growth continues, or whether prices reaccelerate. "I think the big test will be what happens over the September quarter (2016)," Mr Lawless said. "If the RBA sees that the hedonic index reading shows a different trend or comes back into line with other index providers then they'll be making a call on whether they use that time series." Mr Lawless is confident that the changes made to CoreLogic's home value calculations will make them more accurate going forward. He also pointed out that the reason the RBA has preferred CoreLogic's data over recent years is that it better takes account of changes in dwelling composition - such as reductions in floor space, lot size and number of bedrooms - than indices based on a median price, such as APM's. With ever shrinking apartments and townhouses making up a growing proportion of Australia's dwelling stock, having an index that effectively factors in changes to housing quality becomes more important.